Banasure Hill Resort, located 3500 feet above sea level amidst the hazy Wayanad hills is a perfect resort for enhancing your vacation time in Wayanad. 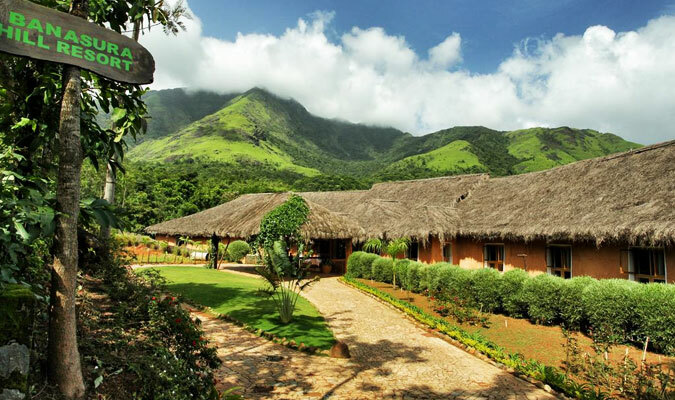 The eco-friendly resort is surrounded by gorgeous lush green fields and rocky paths. The hotel is architecturally brilliant and unique. Also, all the modern luxuries are made available to the guests at Banasura Hill Resort. Suites: These suites are very spacious and boast of traditional Kerala architecture. Log Hut: The secluded and intimate Log Huts are preferred mostly by honeymoon couples. TwinVillas: These very spacious and adjoining villas are ideal for spending a family time at a hotel. Earth Rooms:These enormous rooms, covering an area of 400 sq. feet are built using rammed earth architecture techniques. GuaDua The bamboo restaurant: Multi-cuisine restaurant with healthy food options. Kabani Bar: Well stocked bar housing varied alcoholic and non alcoholic drinks.